Running a field service business requires a multi-faceted attention to detail, and Jobber provides that in spades. It manages your internal work processes and allows you to keep track of technicians working with customers out in the field. Plus, Jobber makes customer service a notable priority with many helpful client-facing features, in addition to the team and business-focused features you’d expect. It will help you turn your new customers into regulars. Two words: Efficient. Multitasking. It’s what every successful business person wants to achieve, and that’s what you’ll get out of Jobber’s vast catalog of client, team, and business features. 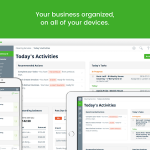 You’ll be able to manage every facet of your business from a single platform. Jobber doesn’t just provide the basics. It goes above and beyond with its features focusing on customer service, so you know that you and your customers will be well taken care of no matter how hectic the field gets. Every field service business needs help with scheduling and dispatching technicians. 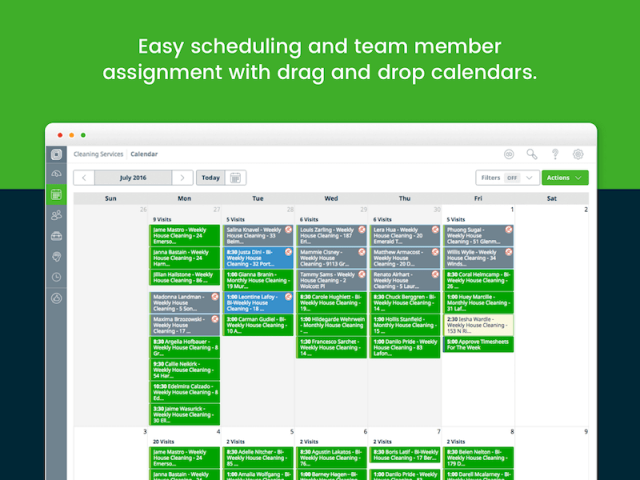 Jobber makes it easy to send out technicians and track their schedule, with a simple drag-and-drop, color coordinated calendar that will improve productivity every day. Plus, you can make simple changes in the middle of a job, so things don’t get too complicated. There’s nothing worse than having to double input data on a daily basis. 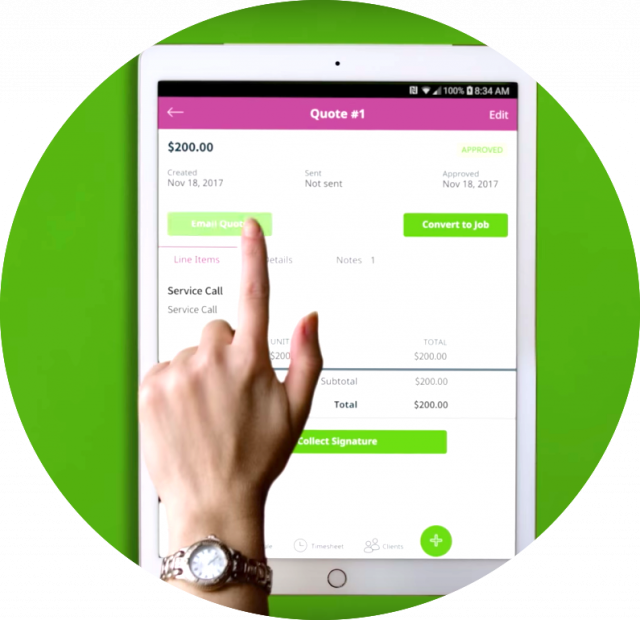 Fortunately, Jobber comes with Quickbooks Integration so all your invoices and payments will immediately sync to the financial software. Don’t use quickbooks? Other integrations include Xero, Square, Paypal and Stripe. Such seamless transfer of information will save you time on an almost hourly basis, so you can focus on more important business processes. Keeping track of your technicians in the field is one thing. 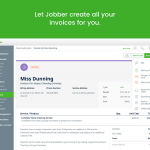 But if you really want to increase accuracy of your business, Jobber is right for you. This software allows you to track your field technicians with GPS, while also providing them with optimized routes to get to where they’re going faster than ever. Plus, it’s customizable, so you can change the route easily, if need be. Customer support is Jobber’s best feature, with a wide range of helpful features designed to make life easier for you and your clients. Their dedicated Client Hub allows customers to solve problems on their own, with a personalized online experience. This 24/7 platform prioritizes customer support, making sure that you’re always there for your customers, even when you’re not actually there. 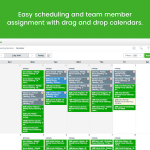 Additionally, the Client Manager gives you all the information you need to schedule repeat jobs on the fly. And with comprehensive client profiles, you’ll be able to keep track of everyone, including exactly who has paid, whose payments are pending, and how much customers still owe you in a single app. 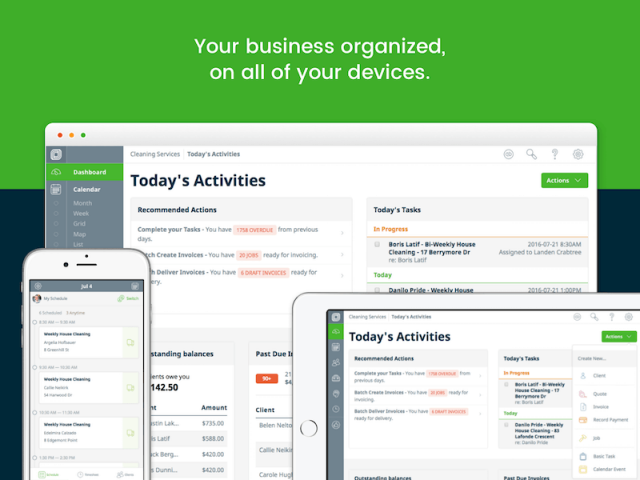 Jobber offer all of their field management services across both desktop and mobile app, so you can stay updated on the move, using either iOS or Android. The app has mixed reviews, with some customers complaining it is difficult to get to grips with and has limited offline functionality. However, Jobber have been quick to reply to customer queries and advise on any issues, reflecting their excellent customer service, and are continuously updating the app to add and improve its features. In the field service industry, happy customers are the key to making an impact. Whether you’re looking to acquire repeat business or reach new clients, you’re going to need a satisfied client base to keep things on track. This video from Jobber explains how they plan to help you put those smiles on your customers’ faces. With plenty of time-saving features and easy payment management, it’s bound to put a smile on yours too. Between the dedicated Client Hub, streamlined customer communication, and client profiles that make repeat business easier than ever, customer service is clearly a priority for Jobber. 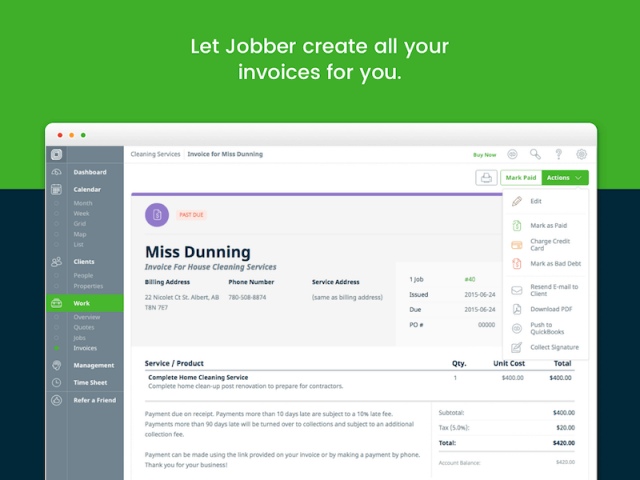 If you want to be assured that your customers are going to be taken care of, Jobber is a no-brainer. You can’t make an educated decision on a field service software for your business before you know how much it costs. Depending on the size of your business, the number of clients you service, and how many people you have managing your team, you could be paying completely different prices. Fortunately, Jobber provides three different payment options for your particular needs. The Core pricing plan from Jobber costs $69 per month, comes with standards features, and allows two users access to the software. The Connect package comes with a few additional features, allows ten users access to the software, and costs $129 per month. Finally, the Unlimited package comes in at $259 per month and, you guessed it, allows unlimited users access to the software. Choosing a plan can be hard, but if you get a tailored quote today, you’ll have a better idea of what your company needs when it comes to field service software. In fact, by using TechCo’s price comparison service you can directly compare a range of leading field service software providers, not just one- so you can find the best deal for your specific business, in minutes. Jobber is typically found at the top of most field service software review sites, and the main reason is their customer support. Particularly impressive, for the relatively low price, Jobber’s customer support team is available whenever you need them, making it feel like a premium service. As for their features, they aren’t particularly groundbreaking, but they are notably easy to use. All in all, Jobber is a safe bet for anyone, but particularly for businesses that might be new to the field service software world. Because sometimes, you need all the help you can get!